BEAR, Del. 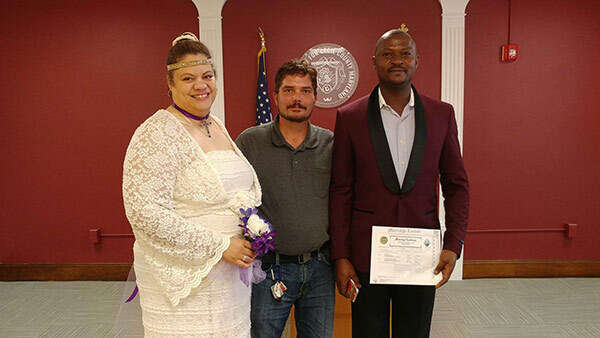 -- A Philadelphia couple eloped with an assist from a sentimental Uber driver who provided a free ride after learning his fares were getting married. The News Journal in Wilmington reports that driver David Scullion II of Bear, Delaware, picked up the stranded couple Friday on southbound Interstate 95 after they had a flat tire. When he learned they were eloping, Scullion offered to drop the fare if he could serve as a witness. The trio made it to the court clerk in Cecil County, Maryland, just in time. Scullion also helped the couple repair the flat and jump-started their car after they had left the lights running in a panic. Scullion told the paper he felt compelled as a hopeless romantic to turn off the fare meter.